Pure Water for the World has partnered with residents of Bouda Chita, a rural community west of Port-au-Prince, to provide clean water and hygiene education. For a community hit hard by the cholera epidemic that swept across Haiti in the wake of the 2010 earthquake, such access saves lives every day. It’s a well-known fact that woman bear a disproportionate burden when households do not have clean water and sanitation access – it’s often women who travel to collect water, who care for sick family members, and who teach their children about safe hygiene habits. It makes sense then, that clean water, safe sanitation and improved hygiene practices can play a part in inciting positive change in the lives of women in the developing world. 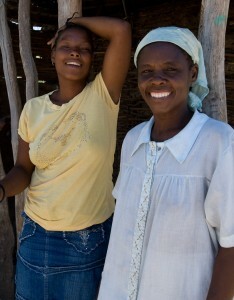 In Bouda Chita, women can now access clean water for their children in their own homes. At Pure Water for the World, we pledge to continue to work to inspire change for women in Latin America in the Caribbean and to empower families to build healthy communities.